I met Ismail (name changed) at King George's Medical University (KGMU) Lucknow, where he had come for his 1st cycle of chemotherapy. An avid smoker since the age of 18, Ismail looked emaciated and much older than his 42 years. In January 2014, he felt severe pain in his limbs and bones which later spread to the chest. He was diagnosed with TB and completed the 6 months’ treatment regimen from the DOTS centre in his hometown. But when his condition did not improve, he was referred to KGMU, where he was diagnosed with stage 3B of lung cancer in November 2014. Rakesh was in the hospital for his 8th chemotherapy cycle with one more to go. (Dr Surya Kant informed that usually patients are administered 6 cycles of chemotherapy— which could extend to 9— at intervals of 3 weeks). Rakesh was happy that he had at least got his voice back and was also able to walk by himself. But how long he would survive is anybody’s guess. 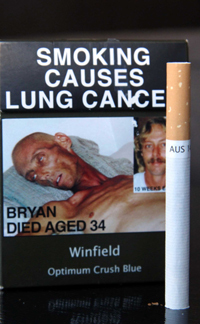 In the United States, cigarette smoking is linked to about 90% of lung cancers. A study conducted by the University of Hong Kong found that smoking increased the lung cancer risk for the elderly by a whopping 421% when compared with non-smokers. A large number of lung cancer deaths could be prevented by avoiding key risk factors, including tobacco smoke, urban air pollution and indoor smoke from household use of solid fuels. The take home message would be, as so aptly said by Dr Surya Kant—stay away from tobacco and stay safe from cancer.